Krispy Kreme is probably going through an all too familiar scenario right now. He wanted stardom, but he didn’t want his privacy to be invaded. Although he’s only had a small taste of fame, he’s already had a great piece of his personal life exposed. But like he says in 3 messages to the haters, “don’t hate the player, hate the game.” In this case, don’t hate the players, hate the game. This is how the game works. A person can’t be famous and have privacy at the same damn time. 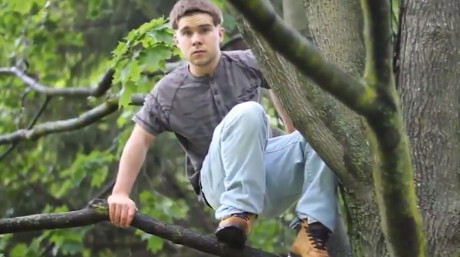 Amongst the revelations about his not-so stupid past, and all the addresses and phone numbers for Tyler Cassidy, we’ve seen the true lyrical abilities of one, Krispy Kreme, real name Tyler Cassidy. I know that I should probably 1V1H Tina Fey’s verse on “Real Estate,” but I would be Krispy Kreme’n y’all. Instead, I’ll just give you a little dose of one the baddest rappers right now. Some are already saying that he’s the next Eminem. I can’t cosign that, but I will cosign Tyler Cassidy.